Preconceptions I had that Twitter was only for broadcasting your breakfast and Facebook was only for finding old school friends were blown away after I used it to research public attitudes to sharing genomic data. Now I’m convinced that social media is the future of social science research. My research is all about the ethical implications of genetics; we need to understand the impact of genetics on people and to use that understanding to steer policy. There’s absolutely no point in implementing genetics in the NHS if people don’t want it, so you have ask a cross section of people how they feel and you have to reach as many people as possible. Before this research started I had never used any social media; I wasn’t on Facebook, Twitter or LinkedIn and I didn’t have a blog. I was slightly dubious about using these channels to recruit people to complete my survey as I didn’t know how credible they would be for serious research. In actual fact, what I got was an eclectic mix of people, including health professionals, genomic researchers, young people and the over 65s. 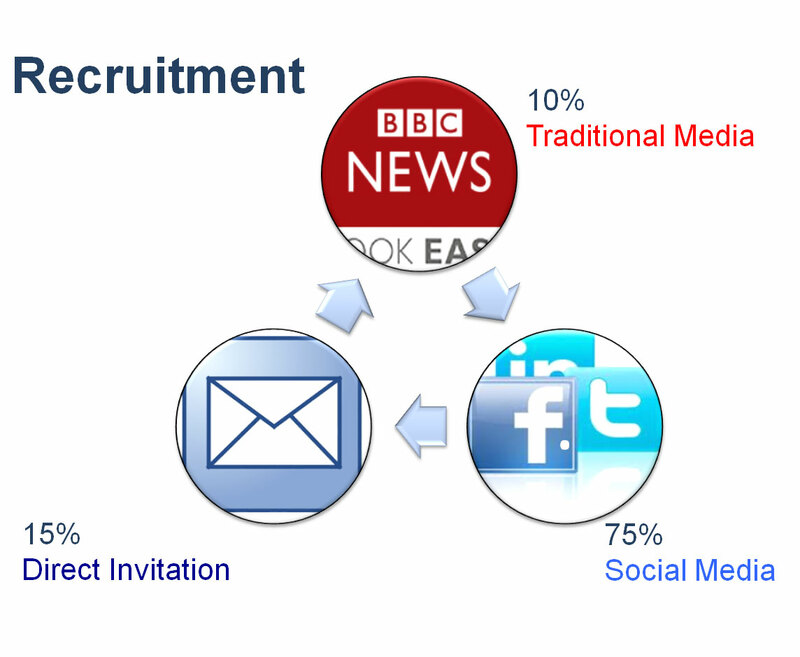 All in all, the sample was as high-quality as any other recruitment method and it returned the highest number of respondents – 75 per cent of the participants in this research came through social media channels. The social media consultant I used recommended that I base the whole campaign around a blog, so we created the Genomethics Blog using WordPress. This was used as a forum to debate the issues and to share news and views from world of genetics. These blog posts were promoted on Facebook, Twitter and LinkedIn and each post linked to the online survey. I was impressed by the number of academics who had a presence on Twitter and who were using the micro-blogging platform to share their work and conduct debates among other academics and the wider public. At a recent conference in Boston, I discovered that I could use Twitter to keep up with the sessions I wasn’t in through the Twitter feed, so I was essentially attending two or three at the same time. My husband back in Cambridge also got involved, by following the conference on Twitter and seeing the reaction to my talk as it was happening. In the coming months, I’m going to be using social media again to disseminate the results and analysis of the research that I’ve conducted. I tweeted about the publication of our first methods paper last week and there were 20 retweets within a few minutes. The feedback is so instant; it’s really satisfying. In the near future, we are going to see a great deal of social science research conducted in this way and it can only be a positive move. For genomics in particular, it’s incredibly important that the public is informed and engaged as genomic technology, testing and treatment moves from the research lab into the clinic. Middleton, A et al. (2013) Online questionnaire development: Using film to engage participants and then gather attitudes towards the sharing of genomic data. Social Science Research. doi: 10.1016/j.ssresearch.2013.12.004. Great article Anna! An interesting read…I am truly fascinated at the level of “connectedness” we are achieving with technology and the ability for different things to be done more efficiently using that technology. It’s amazing really. I have some social statistics on my website and I keep these up there as when they are in black and white it’s hard to discredit social media as the future of pretty much everything! Hi Matt, thanks for your feedback. I’m a complete convert now and can totally see the value of social media as an incredible resource for research. What’s also so nice about it is the sense of ‘community’, people like to chat and share their views. As a researcher this makes a difference as you don’t want to feel like you are putting upon people, you want people to enjoy chatting with you and participating in the research, it needs to be a two way process. Social media offers this.